Take a look at the track listing on any recording of Conlon Nancarrow's Player Piano Studies and you’ll instantly notice that something's wrong: the order of the tracks seems to have gone awry. Study number 2 plays, say, 10 tracks after study number 3, and study 3b follows study 3c. This may seem like mere pretence, but if you listen to the music, you’ll see that the cheeky rejection of order is anything but a pose. Untidy masses of notes, moving jauntingly, stopping and starting as though responding to electrical impulses, are unceremoniously thrown at you, often at bewildering speed, and then disappear too suddenly (the Studies are rarely more than 5 minutes long), leaving you in their wake, gawping. This, however, is not what we find here. Nancarrow's wish to write canons in which the parts proceed at totally independent speeds meant that performers of his time could not play what he wrote, which forced him to turn to a mechanical instrument. This decision created in its turn a continuous search for the musician or ensemble that could finally bring the music 'back to life'. Calefax reed quintet and pianist Ivo Janssen are just one of the recent ensembles to take up the challenge. Calefax's recording has plenty of good qualities. The decision to use a reed quintet is fitting, both because reeds are good with the often bluesy feel of Nancarrow's melody—I dare anyone not to be charmed by the swing of 3c on the sax—and because the neat attack of wind instruments is a more suitable replacement for the piano than subtle strings. Not only this, but the attribution of melodic lines to monodic instruments gives them a character they never had on the player piano: I was taken aback by the klezmer feel of the clarinet opening in Study Nr. 10. Nancarrow often confessed to not having a melodic gift, but this recording contradicts him. Thanks to these new possibilites, it is as if the studies have been washed with fabric conditioner—everything is a little softer, a little smoother. The recording also makes clearer than ever Nancarrow's enduring legacy to jazz: released from the manic commotion of the player piano, the irresistible 'cool' that pervades much of this music—the gentle weaving of horn, oboe and clarinet in 6, on top of the jagged tangoesque ostinato in the piano, has a 'Girl from Ipanema' charm—now comes to the fore. A high point comes with the three two-part studies. 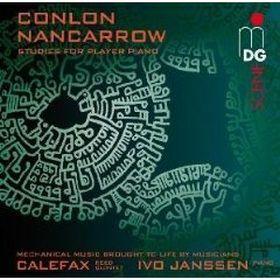 These pieces, which are among the earliest specimens of Nancarrow's work, do not yet use the tempo canons for which the composer would become famous, but are rather an inspired and cleverly crafted homage to neo-classical Stravinsky. Calefax play them with suitable light-heartedness and exquisite grace. It is with the rhythmically brilliant studies, particularly 7, 11, 12, 15 and 18— that we hit a sticking point. A consequence of the 'humanization' of the music has been, unsurprisingly, a reduction in speed. This is often quite dramatic: study 7 is almost three and a half minutes longer in the Calefax version than in the Player Piano one. And in a study that plays so much on manic repetition, and progressive registral and rhythmic saturation, gentleness is, alas, not the best way forward. The famous Nancarrow 'licks' – scales or arpeggios reproduced at inhuman speed—simply turn into everyday musical objects in the hands of a live musician. the same goes for study 12, which relies heavily on the 'licks' as a fundamental element of contrast to the poised music of the opening. The energy produced by the clash between these two types of material has to be extreme if it is to be expressive. Calefax's watered down version (again, three minutes longer than the player piano original) leaves us with something like a half-hearted take on neo-classical Stravinsky. And even the studies where the speed difference is inconsequential, such as 15—a bundle of canonic voices all in different speeds, sounding like a skipping tape—lose their edge as ensemble pieces: the peremptory final perfect cadence, surely tongue-in-cheek, becomes an earnest closing gesture. It is not difficult to see what happened to Nancarrow after the first few Piano Player Studies: his instrumentation became not a restriction but his chosen means of expression. The aesthetic of the mechanical is so deeply ingrained (starting as early a study 7) that to 'humanize' them is to strip them of their mischievous charm. However, it is important to balance out the good with the less good. What Calefax may lack in sheer brilliance and spark, they make up in more traditional musicianship: Nancarrow's earlier studies do actually gain greatly from live instruments, and Calefax delivers as good a performance of them as you'll find.